From the outset, I need to warn you—I’m not exactly going to answer the question posed in the title. Well, maybe I’ll give a somewhat broad answer, after all, but whether your physician prescribes antidepressants for your troubled teen and you follow that recommendation will, no doubt, be influenced by several factors. My aim is to inform you of some dangers and to offer some potential alternatives. Okay, this isn’t exactly a “danger,” but it really makes me wonder if the side-effects and potential long-term issues are worthwhile. Why do many different physicians hold different views on the use of antidepressants, while they would all likely agree about a prognosis and prescription for high blood pressure or other completely physical problems? Medical testing can produce definitive information regarding blood pressure, and the results of medication can be clearly measured, as well; this same scenario is far from the case when it comes to many psychotherapeutic drugs. While many doctors assume that an imbalance of chemicals such as serotonin are to blame for depression and other such disorders, that assumption is both unverified and unverifiable: Serotonin levels are measurable in humans only after death. Because there is no way to effectively measure the chemicals assumed to be out of balance, there is no way to truly tell if a prescribed medication is truly affecting the physiology behind the depression. In fact, some studies seem to indicate that a “placebo effect” may be the reason for most, if not all, reported benefits from antidepressants. Even with the many unknowns regarding antidepressants, you may think that it’s worth a shot. After all, it just might work! If there were no side-effects or long-term risks involved, I might be likely to agree. However, you’ve probably noticed the mandatory warnings regarding the possibility of increased suicidal tendencies in “children” under the age of 25. On a positive end, the risks aren’t really all that high—4% of those taking antidepressants (as opposed to 2% in a placebo group) reported increased suicidal thoughts, but none took their own lives. The risk is obviously still a huge one, though, and seems to underscore the guesswork that surrounds these drugs. Other side effects for various types of anti-depressants include nausea, constipation, increased heart rate, nervousness, insomnia, high blood pressure, sexual dysfunction, and agitation. For pregnant women, birth defects can be a problem, as well. If these kinds of unknowns and side-effects concern you, then perhaps you should consider a second opinion or opt for natural remedies as simple as changes in diet and exercise. In Part 2, we’ll explore some long-term risks as well as alternative therapies. 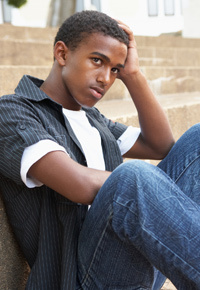 However you choose to deal with your teen’s depression, make sure you don’t ignore it. Uncomfortable as dealing with it may be, the potential for suicide means that the importance of careful consideration and treatment cannot be overstated.